My mind is always racing. I try to keep my mind controlled, but it has a method of its own. A Buddhist monk would say I have a Monkey Mind. It’s not so bad, except for when I sleep. At night it’s no longer restrained by my consciousness and it’s allowed to run amok. I rarely sleep well and often, when I wake, I’m overcome with a feeling of dread, and luckily enough I can’t remember the visions, but I know that my evening was filled with nightmares. I crave a peaceful mind. I crave a good night’s sleep. I crave silence and peace of mind. wonder if other emergency service workers have this problem. 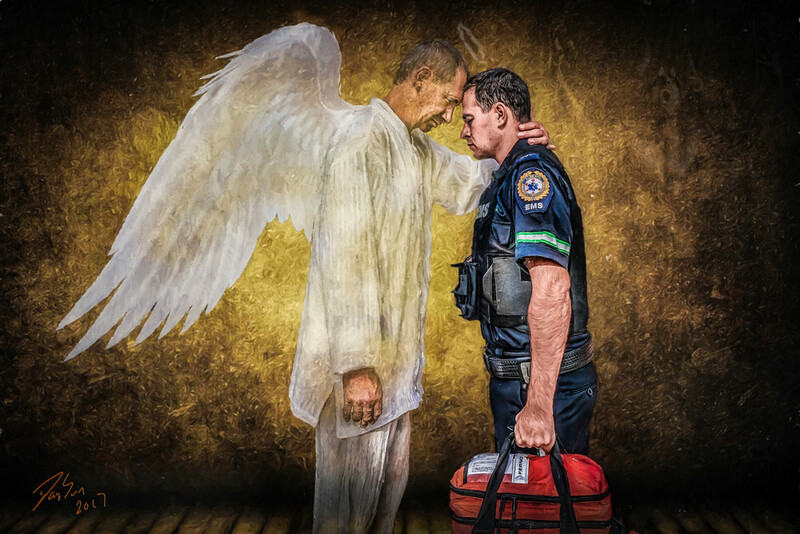 This image shows an angel telling a paramedic to just relax; it’s going to be okay . . . I’ve got your back . . . you’re free of your demon.